An internationally renowned poet, whose work is already translated into 18 languages, has been shortlisted for a major poetry prize. 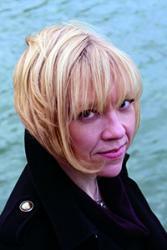 Dr Zoë Skoulding is shortlisted for The Poetry Society's Ted Hughes Award for New Poetry. "These are poems of disappearing sounds, of the fugitive and durable energy of sound itself, and the richness of the sonic environment; poems in which words and sounds and voices and traces of speech are re-discovered; rooms in which ‘a pattern unfolding’ gathers energy from the half-life of sounds into a reconstruction of song; both a collection of poems and a museum of collections." In addition to her role as a poet and Senior Lecturer at the School of English, Zoë Skoulding is a translator, editor and a critic whose interests lie in in contemporary women’s poetry and in urban spaces. Combining these interests has led to collaborative projects with poets and translators in Europe, India and the Americas, as well as bringing some of those poets to Wales for the North Wales International Poetry Festival. She has performed her work to audiences of thousands at international festivals around the world, often incorporating electronic sound in her readings as well as collaborating with musicians. Zoë Skoulding is currently a Laureate at the Récollets International Centre in Paris. This residency, run by the City of Paris and the Institut Français, is offered to established writers and artists who have already achieved international recognition. Zoë Skoulding said: “I am delighted to be on this particular shortlist, as it is for poetry that challenges the traditional boundaries of this artform. Perhaps because I write in English in bilingual Wales, I am always aware of the possibilities that thrive on edges and borders of all kinds." The Awards will be announced on March 28.